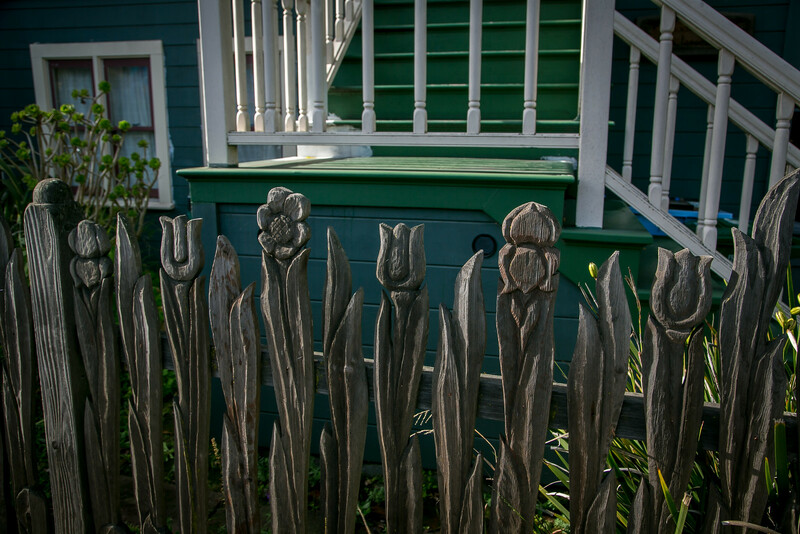 When photographing the murals at the Starry Plough and La Pena, I noticed the carved picket fence across the street. I knew that there had to be a story and that in time I would learn the story. I have! Sheri Tharp grew up in San Jose. 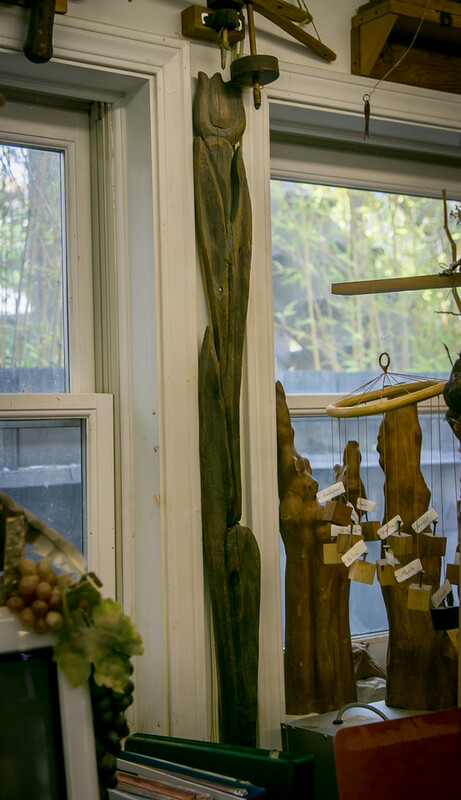 She moved to Berkeley in the 1980s and began teaching wood carving. In 1979, she had apprenticed with Berkeley woodcarver and teacher Ben Shaw. She started teaching his classes in 1984 and took them over in 1989 when he retired. In the early 1990s, a student came to her with a special request. His name was Kurt Kennedy. He was retired from the Lawrence Berkeley National Laboratory where he worked on the linear accelerator. He had a broken picket. It was from a fence at his mother’s house in Kensington that had been built in 1942. 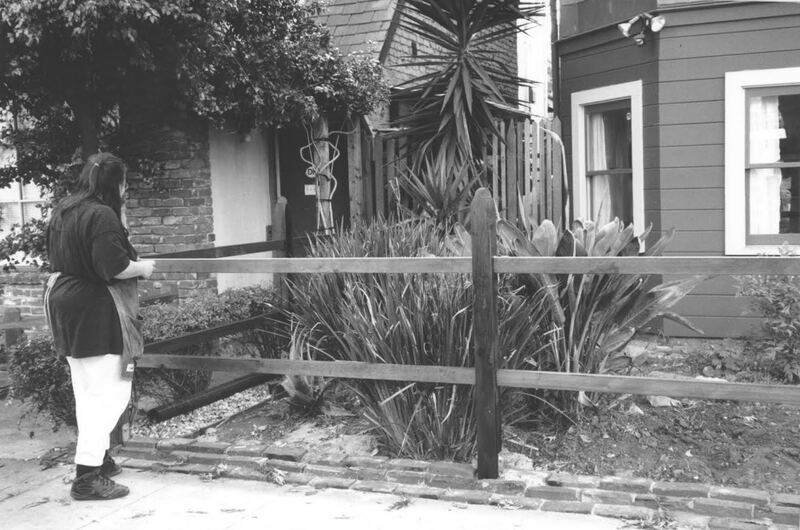 The fence had been designed by legendary woodcarver Charles Sayers. 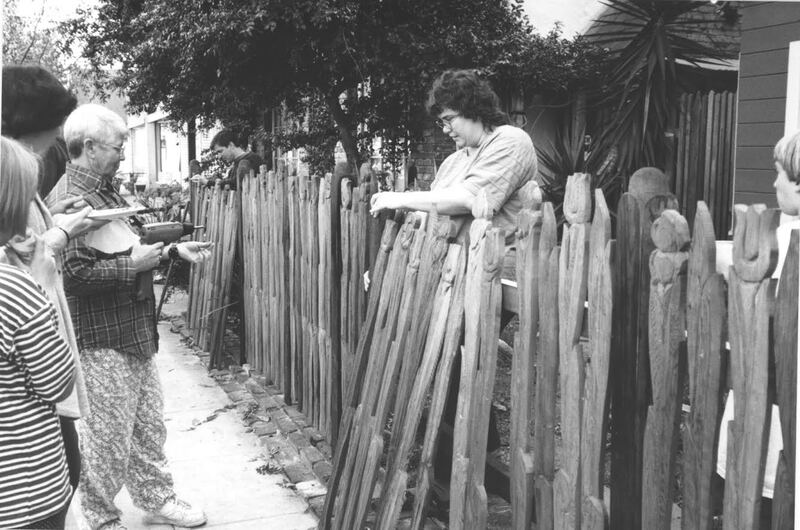 Tharp taught Kennedy to carve and he made the replacement picket for his mother’s fence. But Tharp wasn’t done. 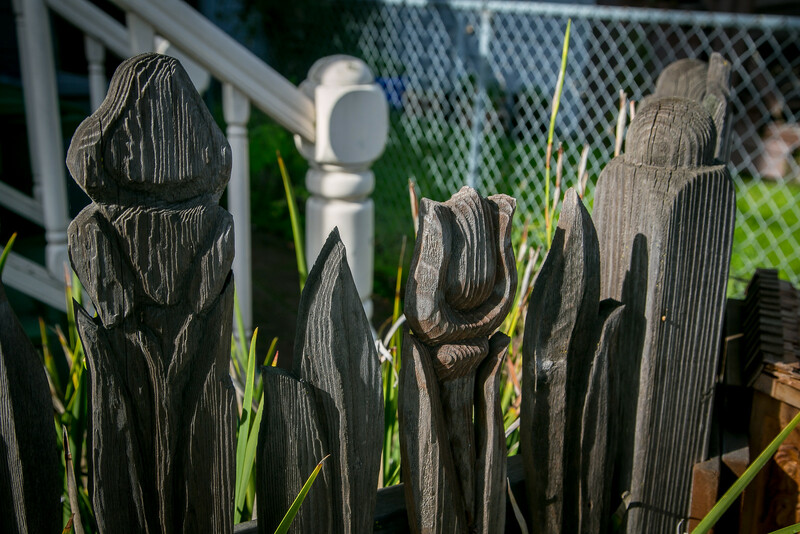 Why not a redwood picket fence in front of her house? Why not indeed? 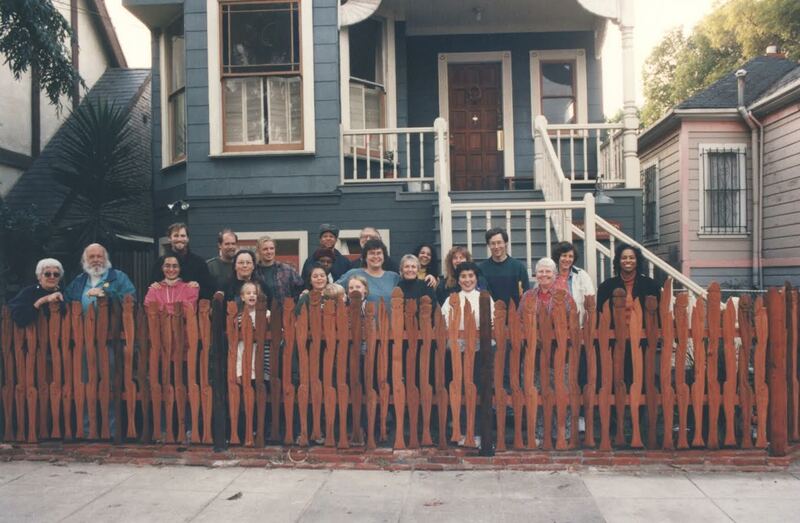 Between 1993 and 1995, Tharp and her students and family hand carved dozens of redwood pickets and installed the fence – more than 50 years after Sayers designed a similar fence for Kurt Kennedy’s mother to carve in Kensington while her sons were overseas fighting World War II. Tharp’s fence is now more than 20 years old. A few pickets have broken and been replaced, and all have aged and weathered. It is stunning. Many of the pickets are signed and dated by the students who made them. 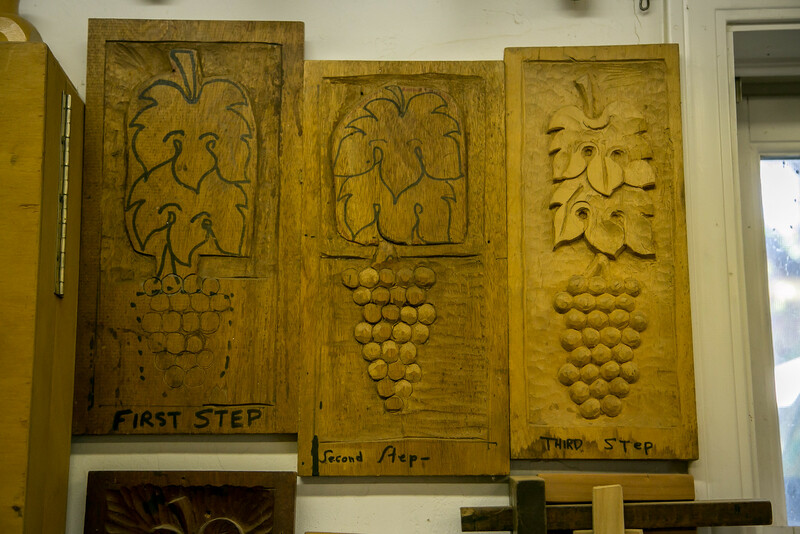 Tharp works and teaches woodcarving on the ground level of the house. 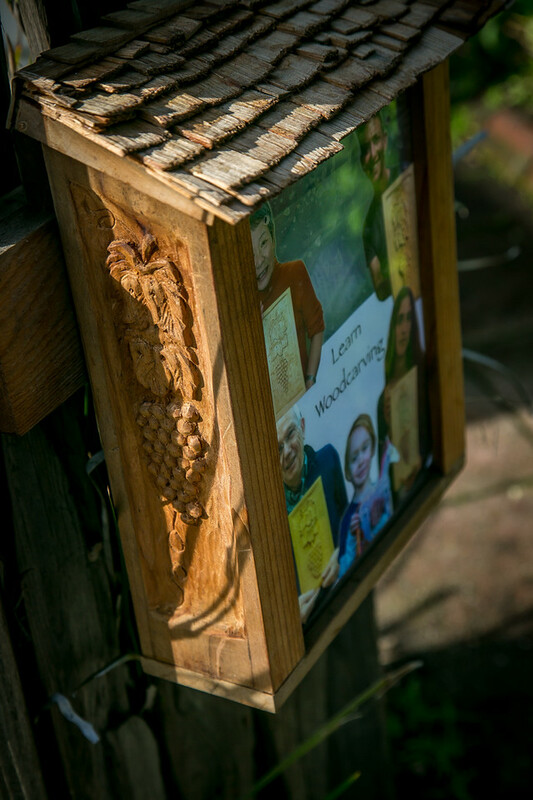 The box on the fence that houses fliers for the carving school features the grapes with leaves motif that is the first project Tharp teaches her students. The grapes with leaves project was handed down to Tharp by her mentor Ben Shaw. Tharp’s website has photos and videos and information about her ongoing workshops and classes. 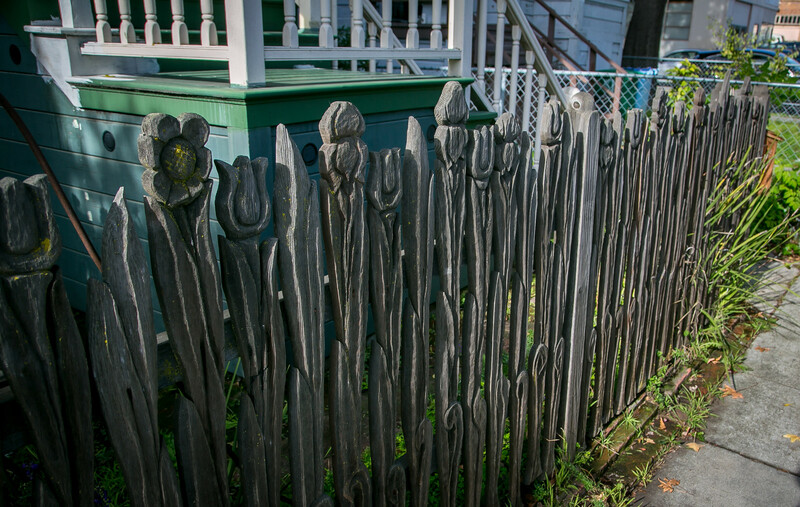 I find this to be a wonderful story about a carved picket fence that started in Kensington with a fence designed by Charles Marshall Sayers in 1942 then carried 50 years later to Sheri Tharp who had been trained by Ben Shaw. 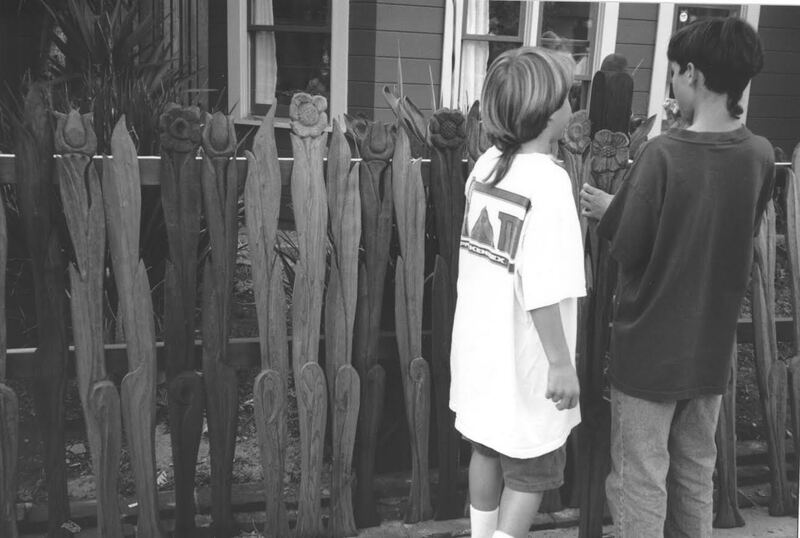 The children shown in the photos installing the fence are 20 years older. The fence is weathered. But there it is. And it is a wonderful story about a woman who as a young and struggling artist came to Berkeley and was able to make a life. We are losing that Berkeley. Some care, some don’t. But we have been oh so much richer and better for the generations of young artists and writers and musicians who have found Berkeley as their home. Tom Dalzell, a labor lawyer, created a website, Quirky Berkeley, to share all the whimsical objects he has captured with his iPhone. 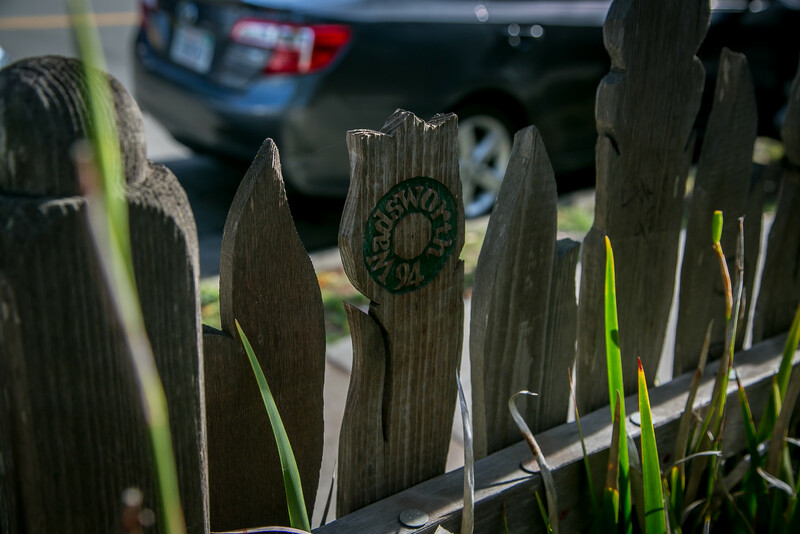 The site now has more than 8,000 photographs of quirky objects around town as well as posts where the 30-plus-year resident muses on what it all means. For a fuller version of this post with many more photos, see Quirky Berkeley.